The ultimate New Year house party! The Working Boat’s lively festivities are sure to put the sparkle into 2017’s arrival. This will include entry and a glass of bubbles to toast at midnight. Includes entry, a glass of bubbles at midnight and four dishes to tuck into. The mini courses will be brought out in half hour intervals and will feature our favourites from this year – including monkfish scampi, mini venison or veggie burgers, and an epic dessert to finish. To help us on this busy night, please let us know when you book if you require vegetarian options or have any dietary requirements. 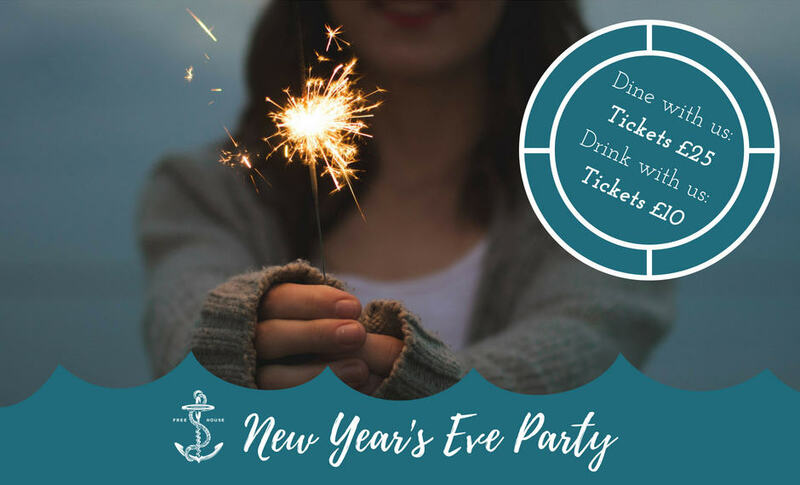 All ‘drink and dine’ guests will also be entered into our New Year Raffle, to win our Winter Getaway for two people to stay at The Greenbank in a harbour view room. We’ll announce the winner on the night just before midnight! Limited tickets can be booked by calling 01326 312440. Pre-payment is required at the time of booking, to secure names on our guest list.